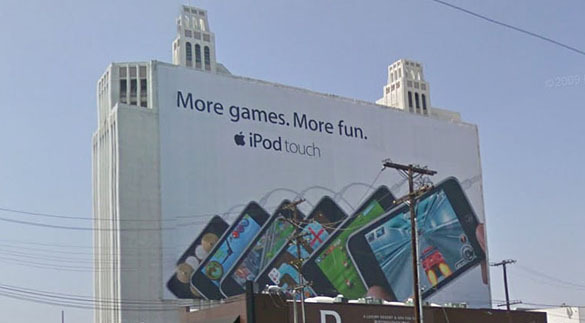 CBS Outdoor has agreed to pay the city of Los Angeles a total of $4,050,000 to settle a lawsuit filed just last week over illegal supergraphic signs maintained for more than a decade on a Highland Ave. building in Hollywood, according to documents filed with Los Angeles County Superior Court. The City has agreed to dismiss claims against the building’s owner, as well as three other property owners who allowed CBS Outdoor to put up supergraphic signs. The properties include downtown’s Figueora Hotel at 939 S. Figueroa St., a downtown office building at 155 Washington Blvd, a building converted to condominiums at 6253 Hollywood Blvd., and the film archive building at 1025 N. Highland Ave. All except the Washington Blvd. building are on the state of California’s historic registry. The settlement between CBS Outdoor and the city calls for a permanent injunction against the placement of any supergraphic or off-site signs on the Highland Ave. building without required building permits. Currently, both supergraphic signs and off-site signs are prohibited outside sign districts and specific plan areas, and supergraphic signs were recently banned in the Hollywood sign district. The settlement also enjoins CBS from installing any wall signs at the three other properties that are not in conformance with permits issued prior to 2002, when the city banned supergraphic and off-site signs. Those permits allowed mural-type advertising signs to be painted on the buildings, but the city contends that the replacement of those signs with vinyl supergaphic signs three years ago violated conditions of the permits. The settlement states that any sign consisting of vinyl with adhesive backing is considered illegal unless CBS Outdoor receives express approval from the city or a court order allowing those kind of signs. The lawsuit filed last week by City Attorney Carmen Trutanich asked for damages of $2,500 for each day the illegal signs were on the four buildings. Such penalties could have potentially added up to tens of millions of dollars. How does the $4 million penalty compare to the revenue collected by CBS and the property owners while the illegal signs advertised everything from movies to soft drinks to toilet paper? No official figures are available, but conservative estimates based upon known amounts advertisers have paid for similar signs in other locations would amount to at least $10-15 million.